Why Install A Double Vanity? You don't need a very large bathroom to benefit from the advantages of a double vanity. Even in smaller spaces, it's possible to have two sinks instead of one. Why would you want two sinks? Well, in bathrooms shared by two people or more, a double vanity enables them to brush their teeth, put on their makeup, etc., at the same time. This means less conflict and more time saved. Double vanities also add value to your home. While one sink is typical and essential, two sinks make your home more desirable and attractive to potential buyers. Often, the choice to buy one home over another is how practical the bathroom is; a double vanity definitely adds to that. Best of all, double vanities fit in all kinds of bathrooms, from traditional to modern and from average-sized to spacious. This warm and inviting rustic bathroom, by JK Architecture Engineering via Houzz, features a large vanity with two wide and narrow sinks. The pairing of natural wood, gray stone and rustic textures make this bathroom cozy, inviting, and warm. The full-width mirror adds light and gives the impression of an even larger space. A raised double vanity, like this one in a bathroom by Abbott Moon via DecorPad, opens the floor space to a gorgeous chocolate brown hardwood floor. Topped by a white marble countertop, the vanity features plenty of storage space for two people. The frameless mirror blends with the wall color, maintaining the brown/cream contrast of the lower and upper parts of the room, a classic and elegant pairing that never goes out of style. Double vanities are also perfect for shared kids' bathrooms. This example by Access Solutions via Improvenet shows a southwestern style bathroom: the muted earth colors, turquoise accents, and southwestern decorative accessories provide an interesting space for children. The double sink means no fighting over who gets to wash their teeth first, and everyone gets a little private space for their favorite hand soap. You don't need a very large space to add a double vanity. Even smaller bathrooms, like this one by Tom Curren Companies via Houzz, can fit a vanity with two sinks. There's enough space for two people to stand side by side comfortably, and enough storage space as well. If you decide to go with a smaller vanity, keep the countertop uncluttered by adding mirrored medicine cabinets for extra storage space. 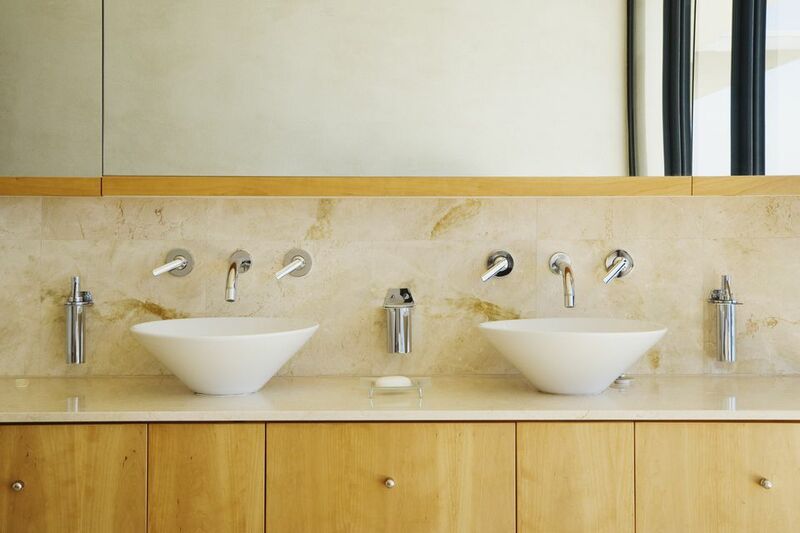 Large vanities can clog up a space because of their size. Counteract this effect by choosing a vanity with open storage, like in this bathroom by Amy Morris Interiors. The open shelf gives space for beautiful baskets to put your things in, and lends an airy feel to the space. The vanity is painted in Benjamin Moore's Graphite, which contrasts nicely with the white marble countertop. Sometimes a side-by-side double vanity doesn't quite fit your bathroom design. Why not try a custom solution, like this face-to-face double vanity by Plum Design West? If you have a large open area, as in this bathroom, it may be a better use of the space to put the double vanity in the middle, rather than along a wall. This ultra-modern design features drawers without hardware to maintain the angular look, and a mirror that recalls the open, ceiling-height windows. Just as with a vanity with open shelves, a floating vanity, like in this example from Ligneous Designs via Houzz, looks light and airy. Enhancing the effect, the cream/slate contrast makes the vanity seem like a cloud floating above a lake. Rounded vessel sinks balance the straight, sharp angles of the mirrors above. Although the style of this particular bathroom is hard to pin down, influences from rustic and industrial styles come through via the reclaimed shiplap siding wall and metallic taupe double vanity. This bathroom by Fiorella Design avoids the coldness of industrial by using warm neutrals and plenty of natural textures like wood, pebbles, and wicker. This pretty, feminine master bathroom by Centsational Girl features an average-sized double vanity with enough space for two people, without being overly large. The tall oval mirrors bring the eyes up, rather than to the sides, and the white and silver color scheme keeps the space light and open. If you would rather avoid the big, bulky look of a typical double vanity, why not have two smaller, separate vanities instead? This is perfect for average-sized bathrooms with not a lot of space to spare. This bathroom by Redbud Construction Services, via Houzz, shows that you can give the impression of a bigger bathroom by giving each vanity some space to breathe. Add a little interest to your double vanity by installing contrasting sinks, as in this example by Angie Gren Interiors. The hammered metal sinks attract the eye and harmonize with the hardware, while French mirrors add beautiful elegance to the whole. The shelf vanity leaves the plumbing exposed and keeps the space open. This warm Scandinavian-style bathroom by NordicDesign features a floating, blonde wood vanity with white vessel sinks, contrasting black and white areas, and a concrete floor. A low-hanging light fixture makes the space feel intimate and cozy, while the rounded shape of the vessel sinks smooth out the otherwise angular features of the rest of the room. Using an open storage vanity is a common strategy to avoid the bulky look of a large piece of furniture. 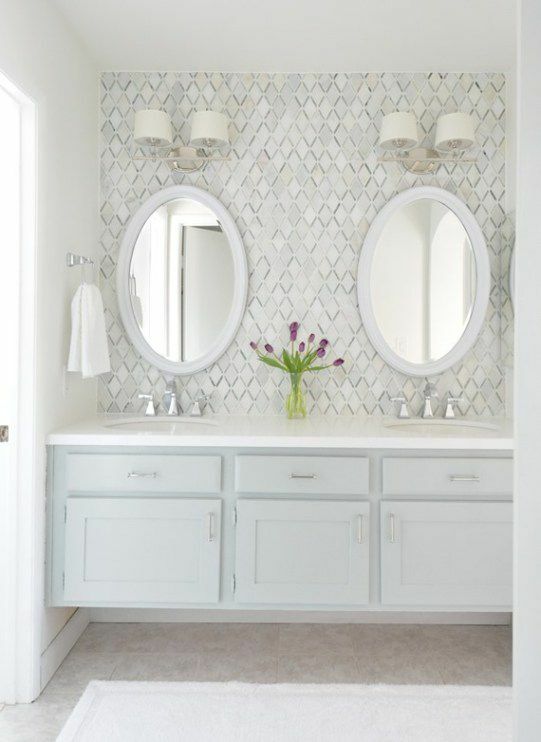 This farmhouse bathroom by Rikki Snyder, via Houzz, uses two small, separate mirrors to highlight the wallpaper pattern and to give the impression of ample space. The ornate vanity adds character and an old-time feel.